Chilly afternoons are just perfect for tea and scones. 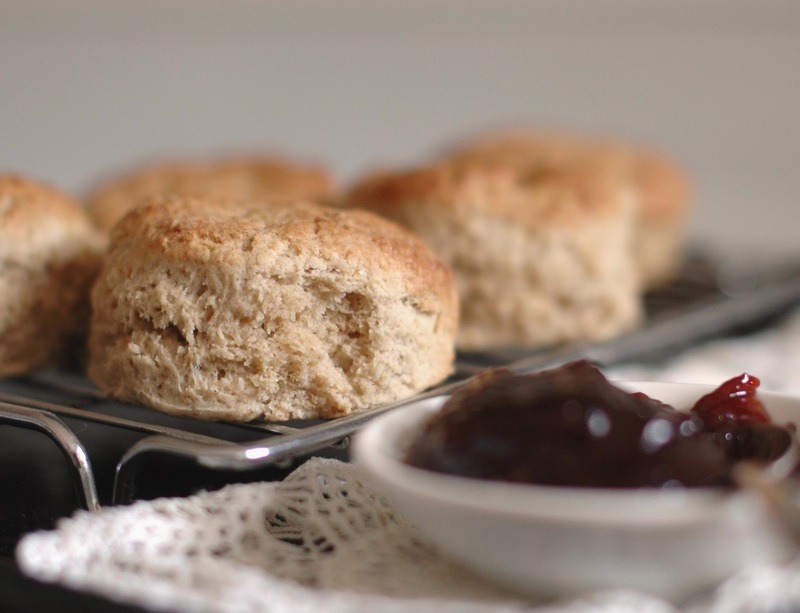 Turn on the oven, boil the kettle and warm up as you let your fingertips do all the work- it’s very important not to heat the butter (even with your hands) if you want perfectly light scones! These use spelt flour with a hint of buckwheat, giving them a uniquely nutty flavour. Serve with your favourite jam: plum works a treat if you can’t decide. 1. Preheat oven 220°C and place rack in the top of the oven. Line a slide tray with baking paper. 2. Sift flours together with baking powder and bicarbonate soda. Stir in sea salt and sugar. Coarsely grate butter over the top and use fingertips to rub it in: the texture should be coarse and granular, much like sand. Make a well in the centre and add the cream and milk to this, then use a butter knife to bring the dough together. If it’s very dry and crumbly you may need to add a little more milk. 3. Turn dough out onto a clean counter and form into a 2 cm thick disc. Use a 6 cm cutter or glass to cut out scones, then arrange on slide tray with sides touching. Brush the tops with milk and bake in the preheated oven for 12-15 minutes, or until golden. Serve warm with jam.